"Thank you for doing an excellent job with our business cards!! We got them a day earlier than expected and they look awesome and are exactly what we wanted! Ordering was the easiest process I've ever experienced! You guys are great!" Three easy ways to create high quality full color business cards. The easiest design option is also surprisingly low cost! We will create a custom business card to fit your needs for a nominal fee with your print order. Simply choose a layout style, upload your custom info, photos and logo and we'll do the rest! Start your design with easy to use downloadable templates for Microsoft Word. Create and upload your own layout in any software format and receive a proof within one business day! Your dedicated team is here to ensure your business card project success. 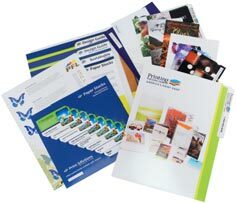 Our pre-press and design experts can help you with file preparation and will review your file, looking to eliminate any problems and make sure you get the results you want. Unlike most companies, we have no extra or hidden charges for reviewing your file and fixing most problems. Get folded business cards templates for more options. Give us a call at 800-­930-2423!